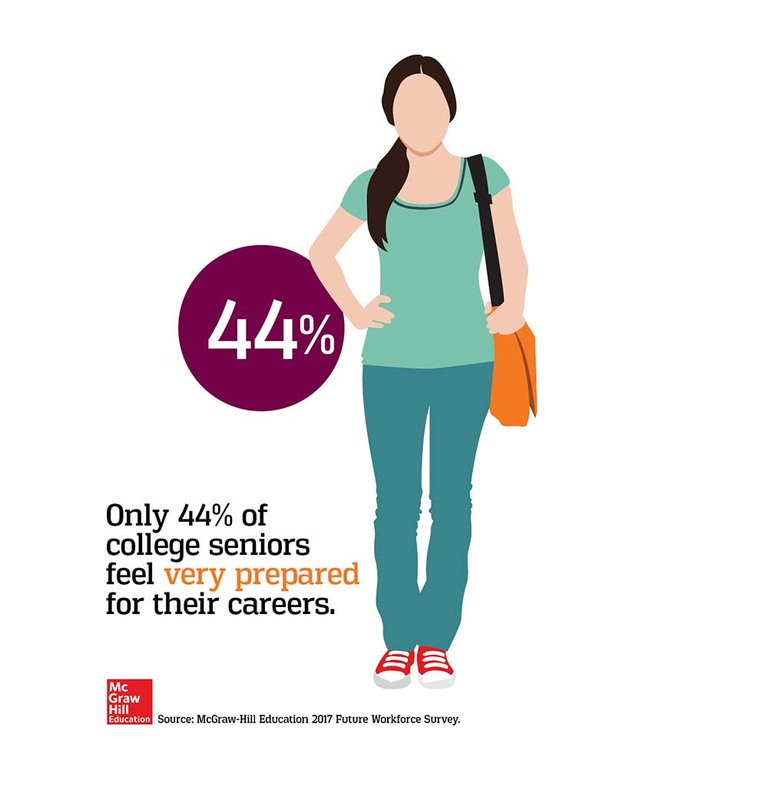 NEW YORK (May 8, 2017) – Only 44 percent of college seniors feel “very prepared” for their careers, but feelings of preparedness vary depending on a variety of factors, according to the results of McGraw-Hill Education’s fourth annual Future Workforce Survey of more than 5,000 college students. A larger portion – 83 percent – of college seniors report feeling at least “moderately prepared,” and the skills that they feel best prepared with tend to be interpersonal skills like communication abilities and teamwork and critical thinking skills, rather than technical, presentation and networking skills. Asked which factors would make them feel most fulfilled in their careers, students’ top three answers were: a good work/life balance, followed by attractive salary and benefits, and opportunities to learn and grow as a professional. The full Future Workforce Survey report is available at: http://mheducation.com/future-workforce. 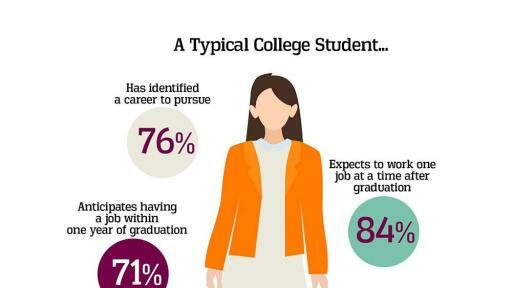 How prepared do college seniors feel for careers? 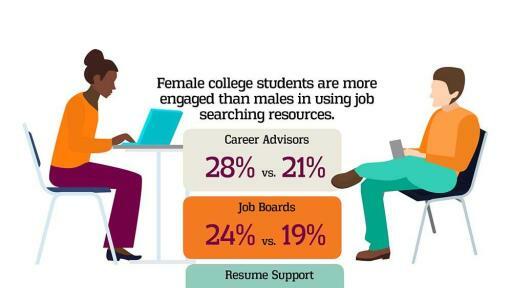 Are men or women more engaged in job searches? The survey of 5,354 students is part of McGraw-Hill Education’s ongoing commitment to partnering with college leaders and instructors to improve student career readiness. It was conducted by Hanover Research (www.hanoverresearch.com) during March and April 2017, using an online survey. Respondents include students at two- and four-year public and private colleges, in all years of study and both in undergraduate and graduate programs. According to the survey, most students are optimistic about both their futures and the value of their college experiences. Some 70 percent of college students report that they are at least somewhat optimistic about their job prospects. 73 percent are at least somewhat optimistic about their future lives overall. 83 percent at least somewhat agree that their major will help them get a job. 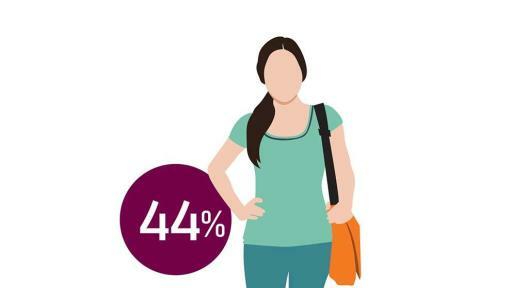 71 percent expect to have a job that aligns with their career goals within a year of graduating – in spite of the fact that most students rarely if ever use the career resources provided by their colleges. 74 percent of students who are actively looking for jobs report spending less than five hours per week on their job search. Interestingly, students who reported that they had identified a specific career to pursue after college (76 percent of respondents) reported significantly different outlooks overall and responses across the board. 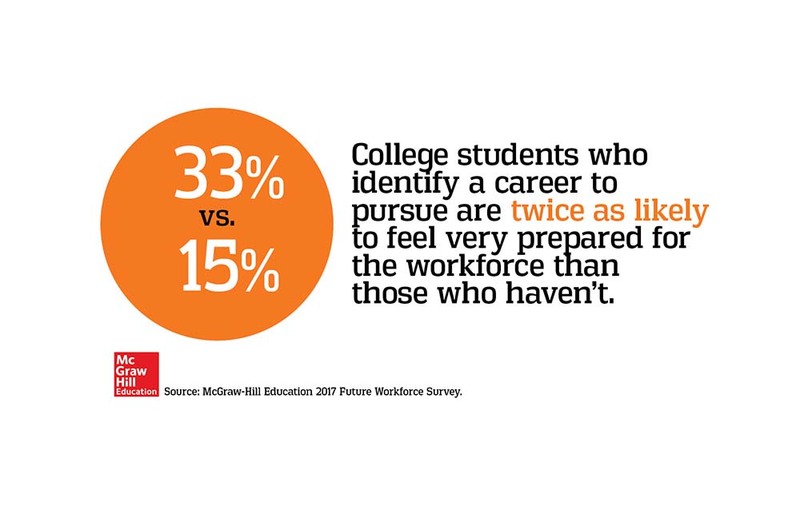 Feelings of preparedness: Students who have identified a career to pursue are more than twice as likely to feel “very prepared” for a professional career (33 percent compared to 15 percent). Feelings of optimism: Students with specific career aspirations are significantly more likely to feel optimistic not only about their career goals (75 percent compared to 53 percent), but are also about their future lives overall (77 percent compared to 62 percent). Length of job search: For students with a specific career in mind, a plurality (36 percent) expect to have a job that aligns with that career before they graduate. For students who are unsure of what career they plan to pursue, a plurality (28 percent) expect their job search to last up to a year. Women continue to report lower levels of preparedness. Men are more likely than women (33 percent compared to 27 percent) to report that they feel “very prepared” for their careers, even though women are more likely to report that they are “satisfied” with the learning and educational aspects of their college experience (86 percent compared to 79 percent). Women are less likely than men to report feeling “very prepared” for technical skills (49 percent compared to 58 percent), presentation skills (48 percent compared to 55 percent) and networking skills (42 percent compared to 46 percent). At the same time, some results suggest that women might be somewhat more engaged in their job search than men. 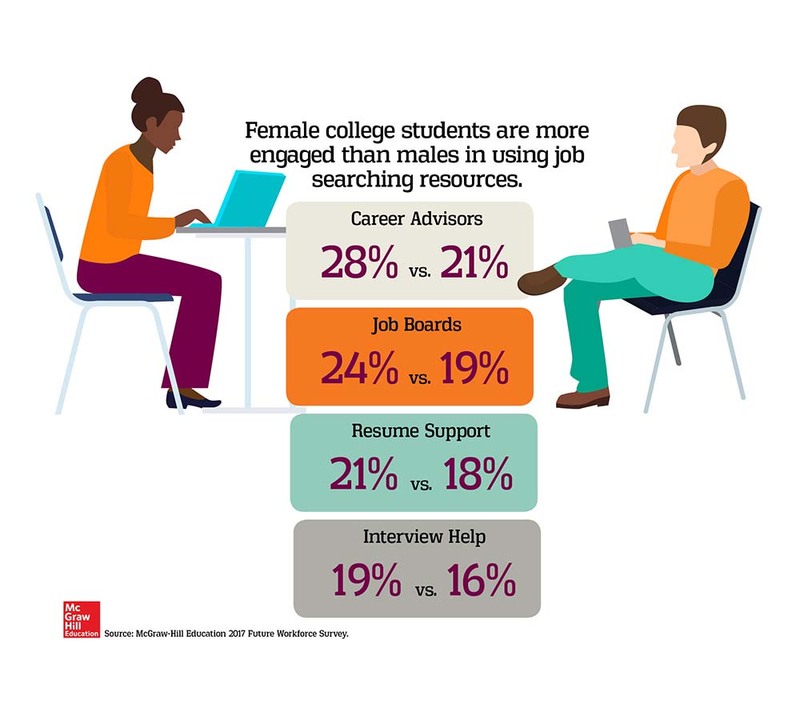 They are more likely to report an intention to “often” use such on-campus resources as career advisors (28 percent compared to 21 percent), job boards (24 percent compared to 19 percent), resume support (21 percent compared to 18 percent) and interview help (19 percent compared to 16 percent).